The Malema Sensors® BCV-980 is a compact, cost-effective, high-performance pinch control valve designed for use with Single-Use flexible tubing systems in the Biotechnology and Pharmaceutical industries. 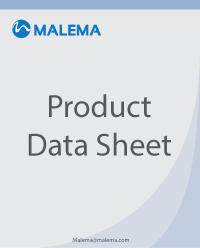 The intelligent control valves utilize Malema’s proprietary integral PID control algorithms. The valve monitors up to four analog signals from external sensors or controllers and modulates the valve position accordingly. The BCV-980 has three modes of operation: manual, remote, and automatic. Local controls allow switching between modes, and adjustment of the set point in manual mode. Status is reported through a local LED display, via multiple analog outputs, multiple alarm outputs, and digital communication using Malema Addressable Sensor Network (ASN) over RS-485 and the Malema GUI interface. The BCV-980 is manufactured from non-magnetic 316L Stainless Steel, fits through a standard ¼ DIN panel cutout (90mm X 90 mm), and accommodates panels of varying thickness.